21 SECRETS Color, Color, Color! 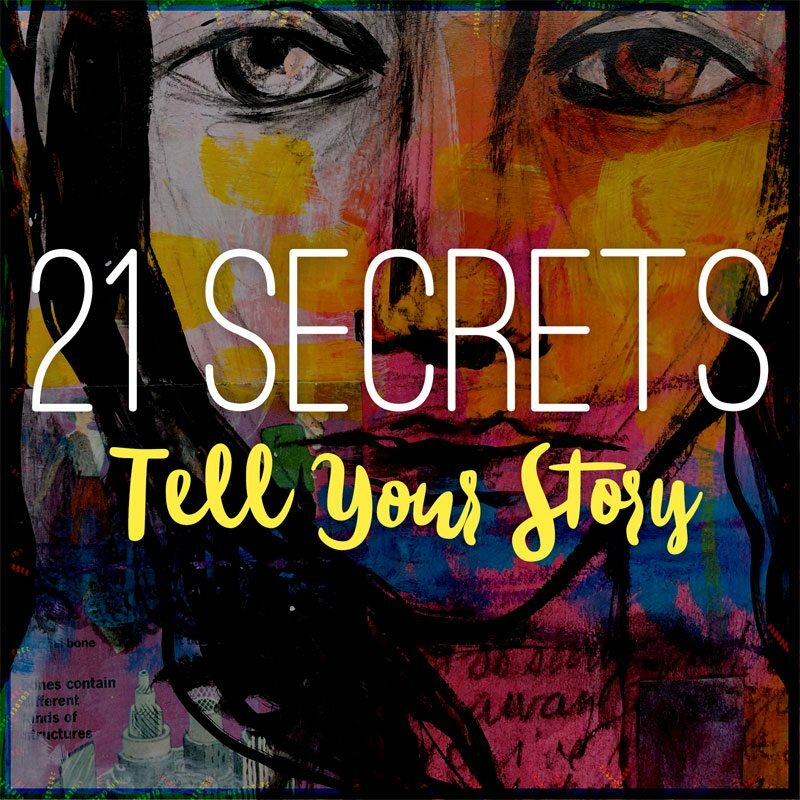 THIS IS THE FIRST 21 SECRETS WITH 3 BONUS WORKSHOPS — ALL FOR THE SAME LOW, LOW PRICE! Art by 21 SECRETS teachers: Shilpa Menghani Ruchandani, Jennifer Mercede, & Hali Karla. As an artist, there’s nothing I love more than Color, Color, Color! Color lifts my spirits when I’m feeling down. It helps me stop and notice the beautiful world we live in. And color always has a way of expressing my heart better than any words can. 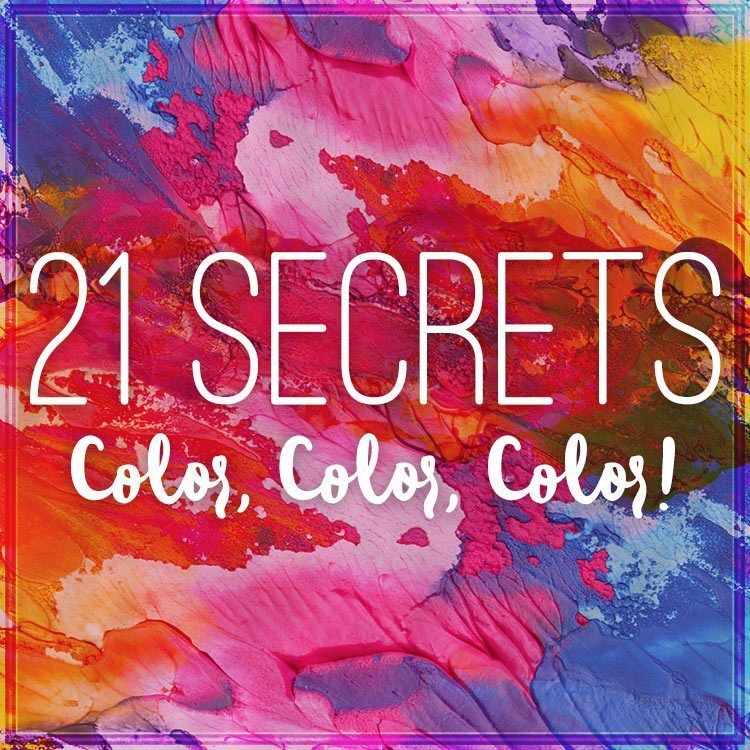 That is why I am beyond thrilled to announce that 21 SECRETS is celebrating, exploring, and getting totally intoxicated on color this Fall with 21 SECRETS Color, Color, Color! Plus, because you can never have too much color, I went ahead and invited 24 talented teachers for this special edition rather than the usual 21 and YES! YES! YES! All for the same low price of $128. 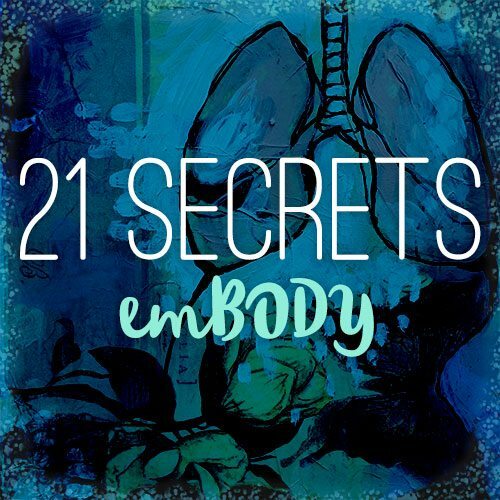 So what is 21 SECRETS you ask? 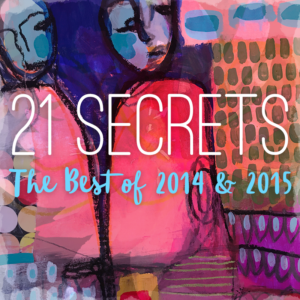 Buy 21 SECRETS now and receive immediate access! Fill your world and your art journal with Color, Color, Color! Keep on reading to learn more. 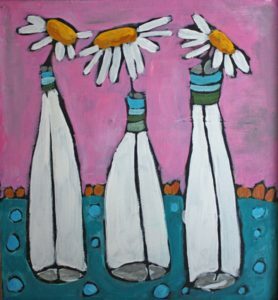 Art by 21 SECRETS teachers: Chrissy Foreman Cranitch, Cait Sherwood, and Imke Rust. Below are descriptions of the 24 inspiring workshops that you will receive in 21 SECRETS Color, Color, Color! Take a virtual trip around the world, and you’ll find patterns on many surfaces that inspire and delight your inner artist. Each of us is naturally drawn to certain colors and designs. If you are in the United States of America, have you ever visited your local Target store and felt your heart palpitate over all of the delicious color and pattern eye candy there? In Draw, Paint, and Print Artful Color Patterns, you will explore color while playing with pattern designs and your favorite motifs. Expressive and abstract patterns to traditional patterns, you will play play play with color, line, shape, and design. You will be encouraged to use a mix of reference photos from nature, magazines, catalogs, etc., as jumping off points, as well as your own intuition. A variety of tools for drawing, painting, and printing patterns in an art journal will be shown. Just imagine where you could take your designs next! I can’t wait to see all of your wonderful color-filled patterned pages! Neutrals and Neons is a class embracing the interplay between natural and synthetic colors. Using paints, found materials, and collage techniques, we will explore what natural and synthetic colors symbolize to us. We will become mindful of color as significant artistic choice. I believe the most powerful Artworks are those that tell an authentic story. Our feelings are our personal signposts and color is a wonderful tool we can use to access and explore our inner worlds. In Color with Feeling, we will delve into what color means to us personally. We will uncover the memories and ideas we have about color and use them consciously in our Art-making. 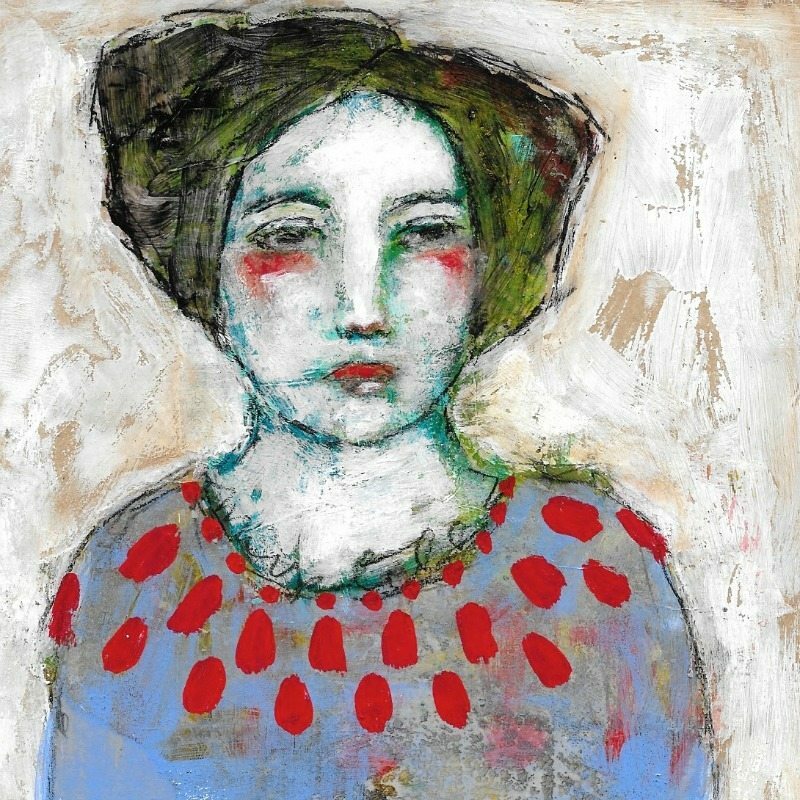 Rather than a paint-by-number class, this workshop will enable us to express our ideas with blobs of paint, scribbles of color and mixed media paraphernalia. Prepare to meet yourself in all your True Colors. Ever get to that point in a painting where you’re absolutely terrified of messing things up but you know it’s still not time to quit yet? (Yeah, me too!) These are the moments when your creativity is at its ripest. In BOLD we’re going to practice taking creative risks, use color in its rawest form, and discover new ways of expressing ourselves bravely, colorfully, and most of all BOLD! In this course, LEAVES study | practice | imagine, you’ll learn how to create art in a different way. practice | the only way to get better is to practice. drawing and painting the same leaf in a repetitive pattern will infuse you with some pretty awesome creative muscle memory. it will also give you some great insight into color-mixing with watercolors! Let go of your fear of using bright colors and discover the joy of seeing what happens when we listen to our inner artist. In Fun With Neon Paints we’ll make bright and colorful mini canvases out of recycled Jell-O boxes then become amazed at what happens when we create texture with recycled bits and pieces. Feeling a little bleary about color theory? Are you sick of the color ‘rules,’ but afraid of making a muddy brown mess on the page if you don’t stick to them? Maybe you’ve just never had a… conventional or careful approach, or don’t like being told ‘how’ to play with color. We’re going to dive in to these waters, trudge up the sludge and splash around making mud on the page. We’ll use a variety of mixed-media supplies for our mess-making experiments. Then we’ll explore some ways for turning that fertile ground into pure, colorful art-journaling magic. Red is life. Or is it death? Why are we drawn to one colour and hate the other? I welcome you on a colourful journey to reconnect with the ancient wisdom and power of colour. Discover the magic, myths, symbolism and effects behind the individual colours, create your personal colour reference guide with the ‘Colour a Day’ exercise and gain a deeper understanding how you can select and use colours for specific intention and purpose in your journal and life. Explore my town with me, gather up fun inspiration and then practice using a limited color palette. Do you ever walk into your studio and feel overwhelmed by all of your supplies? I know that in the past I felt exactly like that. Over the years I have learned that to practice (and practice often) that I do my best with a limited number of supplies. I have no excuses and the biggest tip is that I have become extremely familiar with my tools. This lesson will be about practicing and focusing more on values, sketching, quick painting and not being distracted with too many supplies. Together we will be dipping our brushes into paint to find our unique creative voice in the unexpected world of whimsical landscapes. I will be inspiring you to paint throughout the workshop, making your online experience as personal as possible. Through simple directions and inspirations along the way I’ll be guiding you through the creative process so that in the end you feel at ease with the materials and excited about the potential to create more. You will be a doer. a dreamer. and most import……AN ARTIST. Its amazing the amount of colors you can create by just mixing two together. I always fall in love with the tiny nuances, the shifts between shades when you add just a touch of a touch of a touch of the next color. Then, I love even more, putting those two colors next to each other and appreciating the vibrancy that exist from their subtle difference. In this class we will explore creating shades of color that are so similar that you can hardly know the difference, but if you’re a color lover, like me, you will, oh you most definitely will and it may just melt your heart & take your breath away. Then, to display this breathtaking range of shades, we’re going to design our own color by number drawing and have fun painting it in! Mosey down rural roads to uncover the magic colors of weathered farm woods and the gorgeous rich color of rust. In Backwoods Beauty we’ll make our own ink/dye out of organic materials, and recreate rusting on cloth and paper to be used in our journals or on canvas. Venture with me into the Backwoods! Have you ever stopped to count how many colors are present in the sky during sunset? The answer is infinite. And just like a fingerprint or a snowflake, no two sunsets are alike! Join Lorraine as she explores her favorite color palette in creating watercolor sunsets in her art journal! 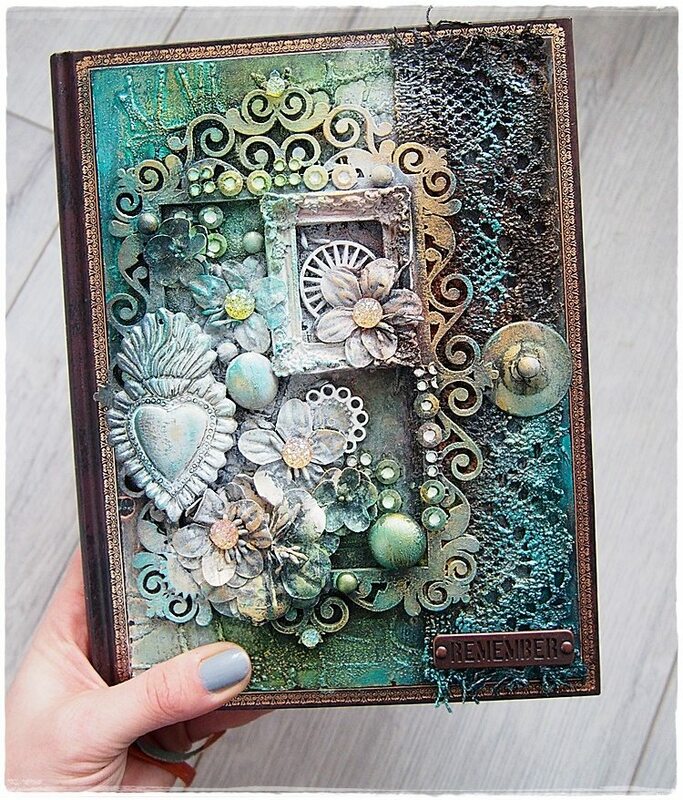 In Textured Abstract Harmony we will be art journaling in an old book using mix of sprays from Lindy’s Stamp Gang and embossing powders. In this workshop we’ll learn how to combine art mediums to achieve the most spectacular colour effects. We’ll build texture by using modeling paste, old music notes pages, stencil and lace. But the fun will really begin once we add the colour. Also in Textured Abstract Harmony we’ll learn how to create extraordinary colour mixes through a ‘slow spray’ technique where our abstract piece will begin to feel like harmony. We’ll finish our piece with a touch of Prima Marketing acrylic paints to bring out the texture. In the end we’ll add embellishments to finish the composition and finish it up with some doodling! Come join the fun! In the Metallic Mandalas and Expressive Journaling I’ll show you how to document interesting patterns with a simple tutorial on creating your own mandala motif booklet. This motif booklet will serve as our visual library as we create mandalas with richly saturated pigments, personal symbols and unpredictable designs as a finished journal page. Through multiple layers of color and unique mark-making, we’re going to give our journal page a little more flavor by incorporate dazzling, metallic paints! Come on and sling paint with me! Bright and bold colors are the beat of my heart. If my soul were made of color, it would undoubtedly be made up of turquoise and teal, magenta and violet, mossy green and mustard yellow. When I see these colors, and especially when I create with them, I am reminded what it is to truly feel alive! In this workshop, we will explore exciting techniques to create colorful layers which become delicious, gorgeous works of art. 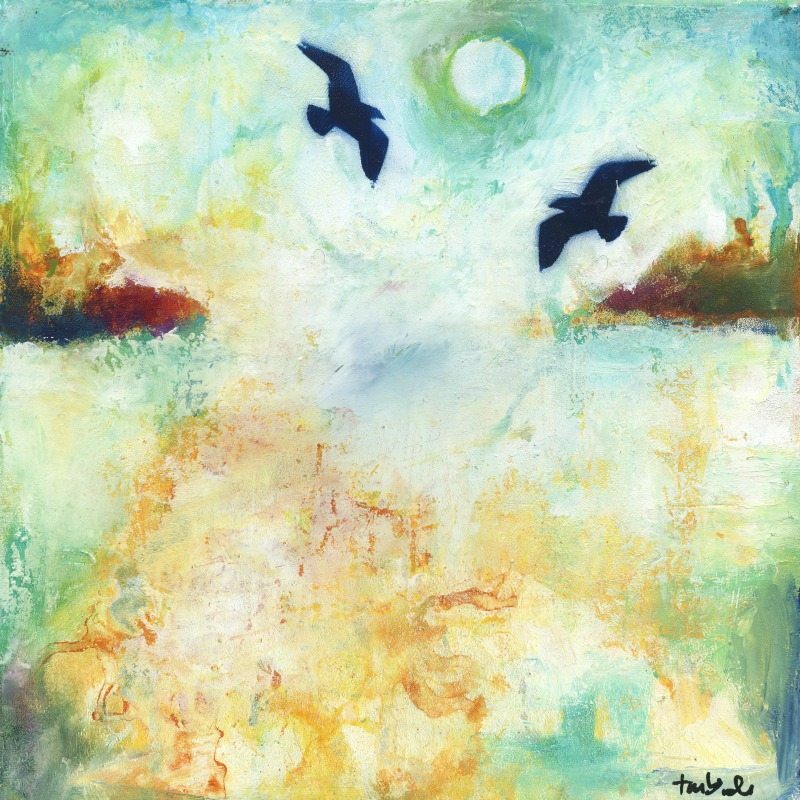 We will give ourselves the gift of letting go and being free as we practice the art of detachment and discover the mystery and surprise that unfolds within a painting. One of the most important things I have learned in art is that contrast and value add a vital element that creates impact in our work. And boy do I love impact in my pages…don’t you? When working intuitively in our journal pages we can often get lost within all the color choices, but we can hold the intention of creating pop and sizzle by using these design principals and still create intuitively and spontaneously. This class is an exercise in using value and contrast with color to make your journal pages bold and vivid. Utilizing the value scale we will explore high, medium, and low key colors and how to use spaces of value and high contrast to create focal points. Using alternating layers of contrasting colors, we will utilize scraping back to reveal depth and texture in the pages. In addition to add more impact, We’ll use a limited palette of two contrasting colors and a few complimentary colors to provide a harmonious feel to the pages. If you were to look closely at the skin of the beautiful darker brown family I grew up in, you would see an astounding variation in the color brown. I think I became truly aware of skin tone when my children were born. My husband (Norwegian, English, Dutch) and I (African, Irish, Choctaw) have two boys who are a glorious combination of my husband’s lighter brown skin tone and my darker brown skin tone. Yet, the boys’ skin tones are so wonderfully different from each other. Incredible! When you really, really explore skin tones with color media, it becomes increasingly apparent how ridiculous it is that we still attempt to label the races monochromatically. Let’s dive into the color “brown” and see what we discover! Then, let’s take a short jaunt toward less realistic skin tones with our favorite warm and cool colors. In this workshop, we will turn our ordinary moments into extraordinary stories. We will go on a photo scavenger hunt seeking out joyful things in our daily lives before stepping onto the pages of our art journals where we will bring our words, images, doodles and paints together for an unforgettable celebration. For this project we’re going to take nine colors: The three primary colors: Red–Yellow–Blue, the three secondary colors: Green–Orange–Purple, and three neutral tones : Dark–Mid–Light Using these nine colours and all your favourite mixed media techniques (and maybe a few new ones) we’re going to make a unique color wheel to explore new combinations to inspire your next creative adventures. I love what I can do with a line on a page….with a scribble, a dot or a doodle…the flow of the ink, the gestural movement, the statement of “here I am”. Enter, wild exuberant and joyful color and you have a mix made in heaven. For me both line and color are crucial for me to capture what I cannot say or express any other way. The control of the line and the chaotic color are the basis of all of my work, and through this I try to achieve a sense of joy that is bold and beautiful and can touch your soul. The bold black lines, squiggles or doodles come from a feeling I have deep within that screams control, perfection and order. The beautiful vibrant colors come from a light heartfelt and spiritual place that whispers wild crazy and chaotic. The interplay between control and chaos is where the magic happens, and that can only come from within each one of us. 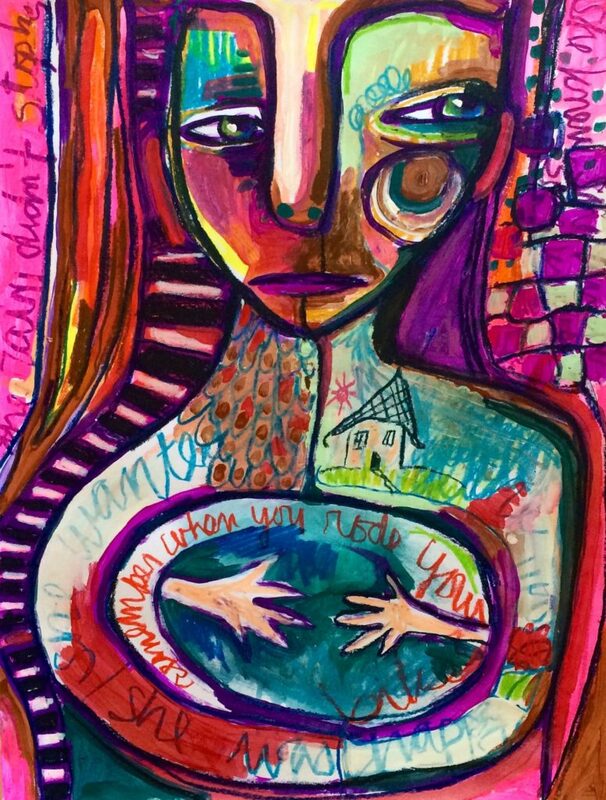 In this lesson I will share how I use line and color to create rich artwork that speaks through you and your own feelings. In My Happiness Project we will begin by playing with complementary color schemes and various techniques, textures, doodles — basically all the fun and exciting things that a journalling process should include! . Then, once we’re all warmed up I will show you an easy peasy way to draw and paint YOU. Yes — YOU! No drawing skills needed – promise! Then, to finalize things we’ll include a letter to ourselves that I’ll show you how to tuck away secretly. Come join My Happiness Project! Let Lady Luck help you find new and unexpected color combinations and then learn to make those unexpected colors work for you! In this workshop we will create a color swatch card deck with whatever paints, markers, pencils or pens you already own and then find new fun and unexpected ways to make your colorful marks dance across the pages of your art journal! Ugly Expressions is a celebration of the messy parts of humanity; all the feelings and colors that don’t fit inside the lines, all the flaws, shadows, and scars. A celebration of things that we no longer need to hide or erase. Let’s use muddy colors, messy lines, uncomplimentary colors and expressive mark making to explore the darker (but no less worthy) side of our inner landscape. Release the expectation for your art journal to be bright or “pretty”. Allow it (and yourself) to be raw, unkempt, vulnerable, and ugly. 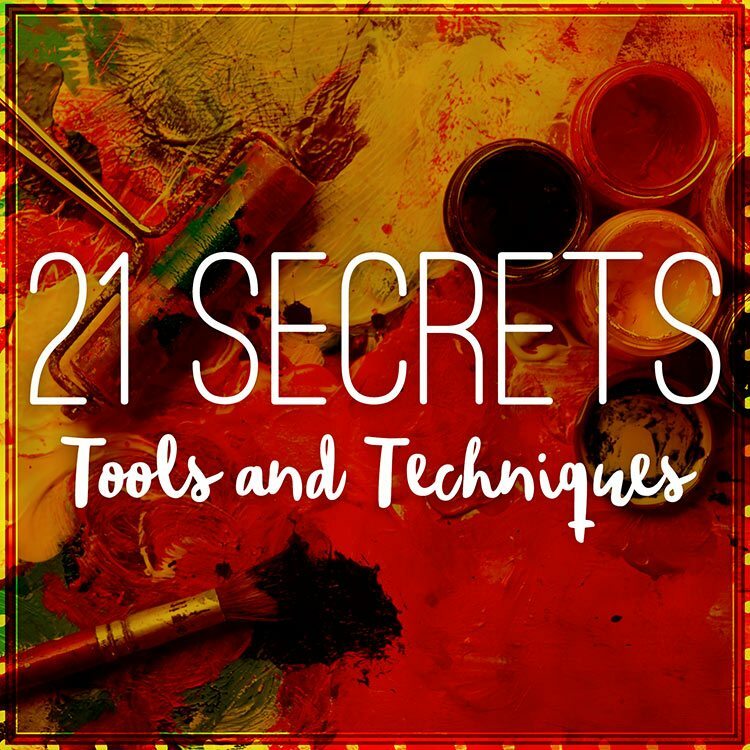 A downloadable 150+ page eBook that contains 24 art journaling workshops packed with 25+ hours of videos, full color photos, templates, and clear instructional content that is yours to keep and refer to again and again. The opportunity to learn a variety of art journaling approaches and color techniques from the comfort of your home/studio. Art by 21 SECRETS teacher: Connie Solera.